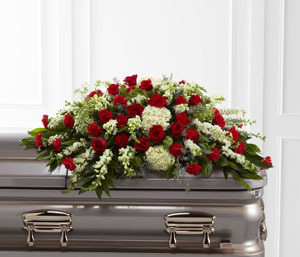 With Love… Rich Red Roses and Carnations are combined with White Hydrangea, Larkspur, Snapdragons and Queen Anne's Lace along with assorted lush greens to create a loving Casket Cover. Queen Anne’s Lace is available most of the year. Hydrangea or Baby’s Breathe will be substitute if Queen Anne’s Lace is unavailable.